Espresso perfection requires precision temperature and pressure control, consistently, every time. At the heart of the Breville BES920XL is its Dual Stainless Steel Boiler heating system. Commercial features and performance, in a domestic foot print. 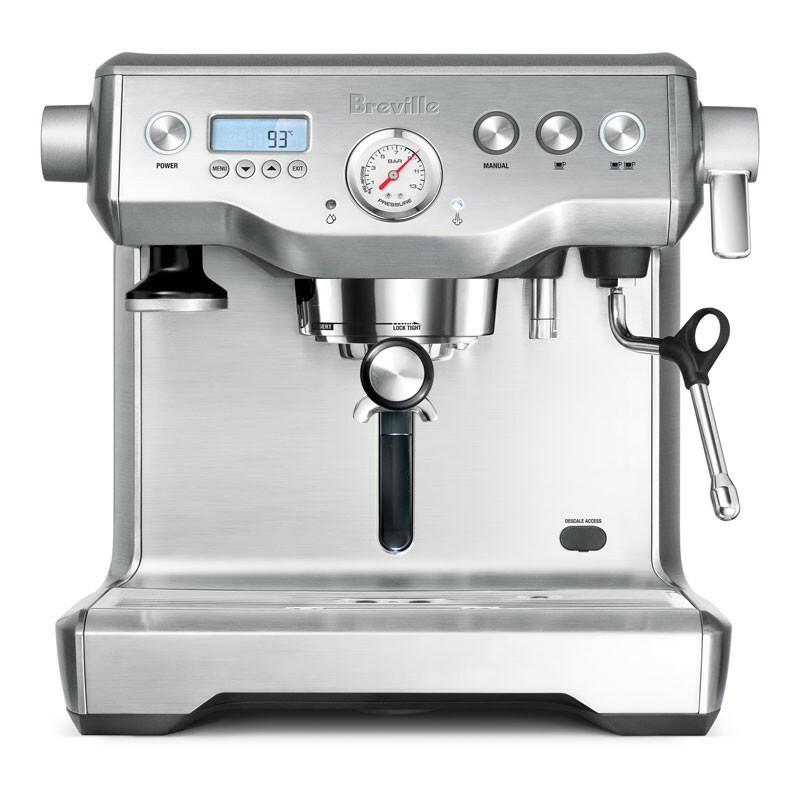 The Breville BES920XL. Espresso perfection, requires precision temperature and pressure control, consistently, every time. At the heart of this machine is its Dual Stainless Steel Boiler heating system. The brew boiler, for the espresso shot, extracts to within +/- 1'C and a separate steam boiler, which offers instant and powerful steam on demand. So you can extract your shot, at the right temperature, delivering optimal flavour and steam your milk to cafe quality, at the same time. What's more, there is another element in the group head, ensuring the entire system offers a consistent temperature. Pull one or two espresso shots and steam milk at the same time. NEW Descale features. Includes water hardness test strip, descale alert and LCD assisted descale procedures. NEW Adjustable Steam Boiler Temperature from 265-285F to control steam pressure. Even more control for your Latte Art. NEW Volumetric or Duration Shot Control. Preset, manual over-ride and reprogrammable. This is great for dialing in your extraction time. NEW accessory: the RAZOR Dose trimming tool. Patented 58mm twist blade trims down the puck to the right level for precision doring and a consistent extraction. NEW 2 year limited product warranty. The Dual Boiler also features an Over Pressure Valve, which comes standard on almost all commercial cafe machines. This commercial feature limits the maximum pressure throughout the extraction, preventing bitter flavors in the shot. It also offers a true low pressure pre-infusion, which gradually increases the pressure to gently expand the grinds for an even extraction. But there's much, much, more to this machine for the coffee geek. Brew temperature and pre-infusion pressure and duration are all programmable. But at the same time we kept it simple, with a quick heat up, front fill water tank and programmable dose. And a shot clock and pressure gauge to help you improve your barista skills over time. All you'll need are some freshly ground beans and a bit of practice to rival the best cafe. Amazing machine! I wasn't sure if the additional investment (upgrading from a Breville Cafe Roma) was worth the money. However, all doubts were erased as soon as I poured the first double shot (stock settings) into the cup. Smoother than anything I had produced with the Cafe Roma and the milk's texture (we drink a lot of lattes) was silkier as well. Now I need to work on my latte art skills.